Laboratory Tested Safe for all Potable Water Supplies and Fire Protection Sprinkler Systems. Johnson's Water Removable Soldering Paste was originally developed for the Fire Protection Sprinkler Industry under a CDA STM 1.0, which later became ASTM B 813-93, the standard for Plumbing Fluxes in California and a few other areas. Johnson's Paste is a non-Zinc Chloride Flux that works like a true Soldering Paste, not a gel, liquid or wax. Our smooth white paste is very easy to apply, enabling fast and total coverage of the parts to be joined. Johnson's Water Removable Soldering Flux is safer to use on brass because it contains no Ammonium Chloride and safer for copper because it contains no Zinc Chloride. Its residues flush down the drain quickly, even when using cold water. It is safer for the environment because it releases no harmful or toxic chemicals into the sewer, nor toxic fumes into enclosed workplaces. This Johnson flux is also becoming well-known for use in the stained glass industry. It's safer than many other fluxes, both from the standpoint of its residues (no zinc chloride) being flushed into the waste stream, as well as not releasing toxic fumes (no ammonium chloride) into your workplace. It's easy to apply a small amount of paste flux on one, or a group of joints to be soldered; it stays in place without running off or staining your workpiece. It offers what seems to be just the right amount of aggressivity for removing surface oxidation from copper, just before your hot iron has melted Johnson's IA-423 Lead-free Solder. 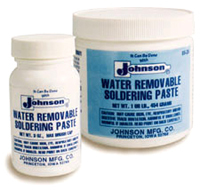 Johnson's Water Removable Soldering Paste resists charring and its residues are easy to remove with just water. We think once you've mastered the technique for using IA-423 and WRSP, you'll never want to go back to your leaded solder (60/40) and old style flux again, nor should you. View our Technical Bulletin on Water Removable Soldering Paste. Read the Ames Laboratory White Paper for full report. View our Technical Bulletin on IA-423 Solder.